I hope not, it's about Xmas not Sprint!! Next they'll have salesmen selling you on their plan or passing out leaflets. One of the newspapers will probably raise a stink about this once the train debuts to the public, if they're not reading this forum already. Just think of all the kids (and adults) who enjoy the holiday train each year, and now Sprint has to drop their ads in the middle of that experience. It isn't like Sprint is preventing the crew from dropping off donated food at the homeless shelters. It might even be donating some. I don't think anyone can complain about commercialism when a good percentage of L cars have commercial wraps, inside and out. I remember someone on the CTA Tattler making some comment about some service being publicly owed meant that there won't be ads, and I said compare the restrictions on rooftop ads on taxis to fully wrapped buses. I'm surprised that the I-55 express is not sponsored by WeatherTech of Bolingbrook. Sprint probably is donating food, but I still say they're greedy for insisting on advertising on the train. They probably threatened not to sponsor the train if they didn't get their way. But there are other things they could have done. In addition to station ads, references to the holiday train on the CTA website could prominently mention Sprint as the main sponsor, or call it the "CTA Sprint Holiday Train". (Of course, I don't know that they won't be doing this too). My main point is, the train should be kept ad-free for the children experiencing it for the first time. Well, who, if anyone, was sponsoring the train before then? 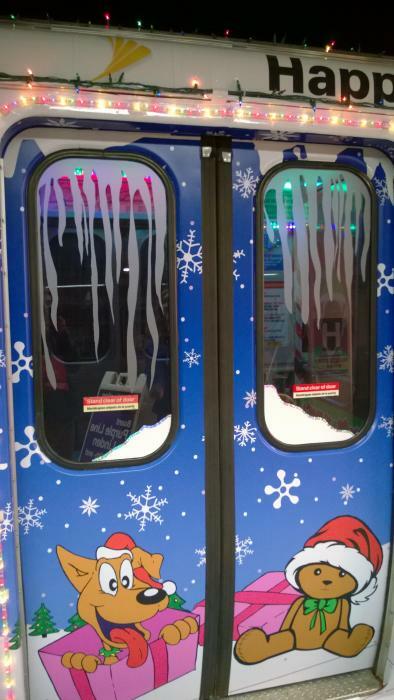 The only thing that was said up to now was that Kruesi was a grinch for trying to cancel the train during a Doomsday year, because the employees were donating their time to decorate it. I take it you are not going to the Walt Disney Festival of Lights Parade, promoted by Disney subsidiary WLS TV, or the McDonald's Thanksgiving Day Parade. I wonder why it is no longer sponsored by Dominick's . * There were a couple of years when the organizers put the reviewing stand in front of Old Navy instead of Macy's, for obvious reasons. *I also wonder why a Jewel that used to be a Dominick's is being converted into a Safeway, but that's for another day. Since you asked, I tried to find out who was sponsoring it, and apparently the answer is: no one. 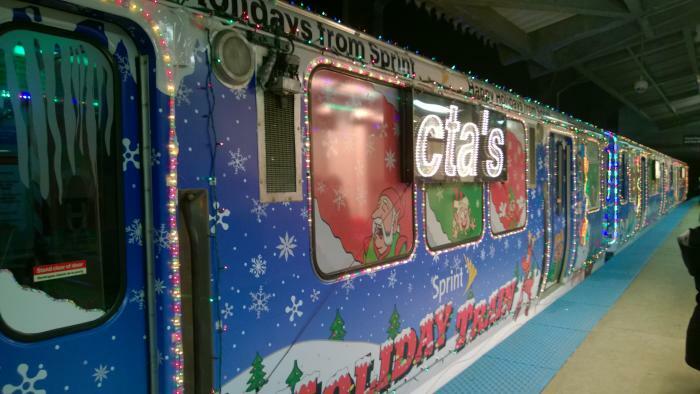 CTA tried to get a corporate sponsor for the holiday train starting in 2012, but must not have been successful until now. So I stand corrected. No, I will not be going to either parade, but not because of them being "commercialized". I'm not even sure I'll bother with the holiday train this year, unless I happen to be in the area when and where it's running. ...Just think of all the kids (and adults) who enjoy the holiday train each year, and now Sprint has to drop their ads in the middle of that experience. We haven't seen the inside of the train yet, nor have we heard the announcements for the Holiday Train when boarding to see if they talk about Sprint. Though I wish the hopper windows on the train didn't have the Sprint logo on them. We'll have to wait and see how heavily Sprint is promoted on the train besides the livery modification. Yeah, it's way overcrowded, the best place to see it is on places that don't have alot of riders like the Green or Pink line. They really need two trains. Somewhere in the near future they will have to address a #3200 or #5000 series train. What better time than to have two trains and make one a test. They sure have enough extra #5000 cars laying around to do it. The past two years I've gotten on at Harlem/Lake on Black Friday which is the first day the Holiday Train is running. There were enough seats for everyone until downtown when a few people had to stand. I think another reason it's not that crowded on the first day is that news of the train running by word of mouth hasn't had much time to spread yet. Yeah one year I rode all the lines, most of the stops. (missed a few on the south side) When it pulled out from Harlem/lake I was actually by myself. 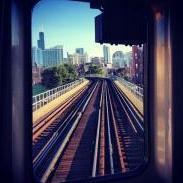 Going south on the green line is good too because no one much rides there. The Pink line stays dead too until polk then it picks up, but normally a 6 car train there is over the ridership quota, so your chances for a empty trip will be good. On the forest Pk branch ridership is empty but once it hits the loop it starts getting crazy, the whole north side is a cattle car. The red, orange and brown are pretty busy the whole trip. The purple in evanston is not bad either. Anything before the Brownage and Pink is a comfortable ride, after that plan ahead! 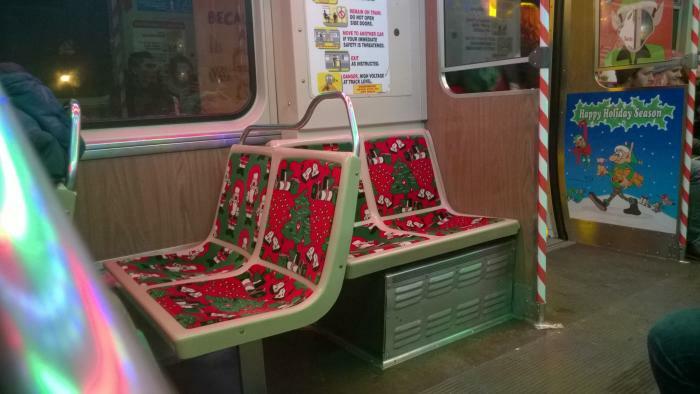 Cautionary Note: Saturday's are not ideal to ride or view the holiday train due to families enjoying the festivities. A weekday run would be ideal, but the Red North, Blue O'Hare Branch and the Brownage Ravenswood runs are ones that you just want to avoid! 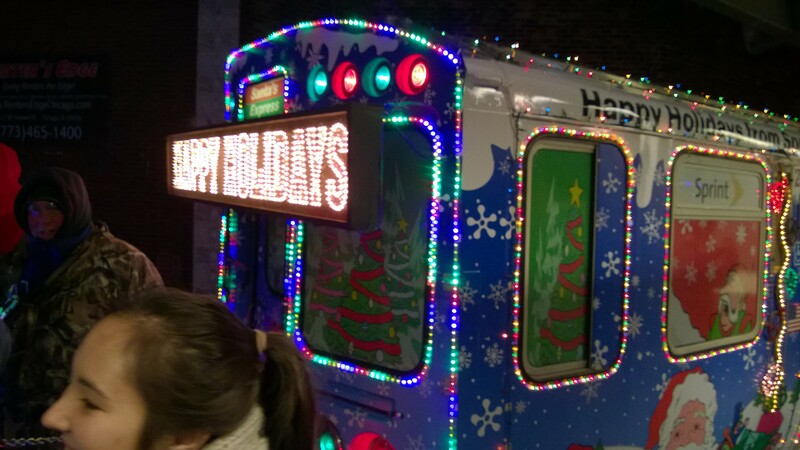 Just spotted Holiday Train SB at Sheridan. Will post pictures when I'm at a computer. Yep, just saw it a few minutes ago going south on Red Line tracks at Fullerton. Been a while since I've seen 2600s there! All lit too. Saw it by Granville headed NB towards Howard around 2:30 this afternoon. Press release on all the good done by the Sprint sponsorship of both the holiday bus and train. Note the one year deal. There was a prior 3-year sponsorship advertised in 2012. But as someone pointed out above, it didn't happen, as reinforced by the press release statement "In a first-ever sponsorship arrangement..."
For that matter, wasn't that part of the solicitation for naming rights to the stations? Any of them get picked up? They're running the train tomorrow - that's short notice! I don't think many people will come out specifically to see it. I wonder if the real purpose of tomorrow's trip is to make a big deal about how Sprint is sponsoring it. The scheduling seems a little odd to me. Probably linked to the Festival of Lights Parade, although the weather is supposed to be lousy. 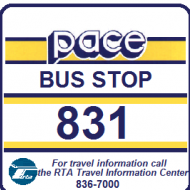 Banner is on the CTA site now; schedule page is here. That could be. The parade is from 5:30 to 7:00. Train stops southbound at Grand at 5:20, and return trip northbound at 7:06. 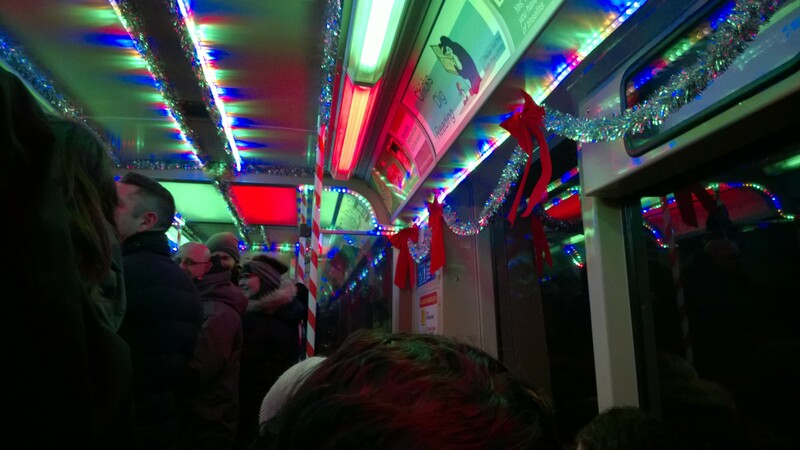 So someone coming from the north could conceivably take the holiday train both ways, though they'd probably miss a few minutes of the beginning and end of the parade. The reason I said it seemed like it was mainly to advertise Sprint was 1) It is on the red line, the busiest line, 2) Sprint didn't have to pay for additional trips, and 3) Announcing it the day before doesn't give people much time to find out about it and plan their trip accordingly. Members of the news media are most likely to find out, and a few will likely be on board the first run. For Sprint that hopefully means more publicity, and therefore more riders seeing their ads once the train resumes operation on Black Friday. The train is run #1225 for those looking for it on the Train Tracker its on the Red Line. Classic CTA, it was running quite late both southbound and northbound. Because it was so late going southbound, we didn't catch it then (supposed to arrive at Fullerton at 5:10, ended up getting on a 5000-series consist at 5:24 because the train didn't arrive yet, and we wanted to go to the parade). We did catch it after the parade going north at Grand, though! It was somewhat packed, but not horrible - we got a seat after a stop or two. Took it all the way to Howard and got a picture with Santa! Does The CTA Holiday Train Have To Be A Nightmare To Ride? Your last chance to get a comfortable ride on the Holiday Train is this Tuesday and Wednesday on the Pink Line. After that, tough luck as it heads to the "money routes" the Blue and Red Lines for the remainder of the season. P.S. Any trip north of Belmont during the Purple Line Express runs are comfortable as well.